As a child, I only watched cooking shows, and seeing the chefs work and plate always had me mesmerized. That fascination led me to baking at home and pulling my parents along to all the new restaurants that popped up in my city. I soon decided that I wanted to be a chef and have my life revolve around food. 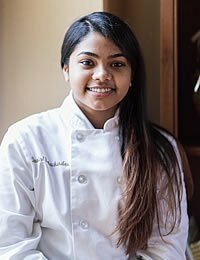 Damini Balachandar is a baking and pastry student who received CIA’s Global Scholar Award. While researching about the CIA I realized that it was one of the few culinary colleges that provided practical experience and gave the students as much exposure to the industry as possible. Along with shaping their students into great chefs, it also provided them with leadership opportunities such as the resident assistant or group leader positions which further developed them into great leaders. This along with the stellar reputation of the CIA made it the best choice for my education. I received the Global Scholar Award. This contributed to my education at CIA. I believe that the way the program is structured really helps you learn about all the facets of the industry. The chefs and instructors are highly educated in their fields and make the classes extremely informative and interesting. The academic classes and the kitchen classes also go hand in hand. There are a huge number of resources on campus such as the Tutoring Center that help you excel. Another thing that I really like about the CIA is its diversity. You’re going to find people from all over the world on campus but you’re never going to feel left out because the one thing that binds everyone together here is food. I am an international student ambassador, orientation Leader, and part of the Welcome Team. My favorite dish to make is dal. It’s an Indian dish made with lentils and is usually eaten with rice. I really love making dal because it’s super easy but at the same time is really comforting. We learn a lot about hospitality and professionalism. These classes help highlight the importance of good relationships with staff and customers, which is vital in running a successful business. We also learn about food costing and business plans extensively. I feel one of the greatest lessons I’ve learned until now is to respect everybody in the industry irrespective of who they are and what they do. 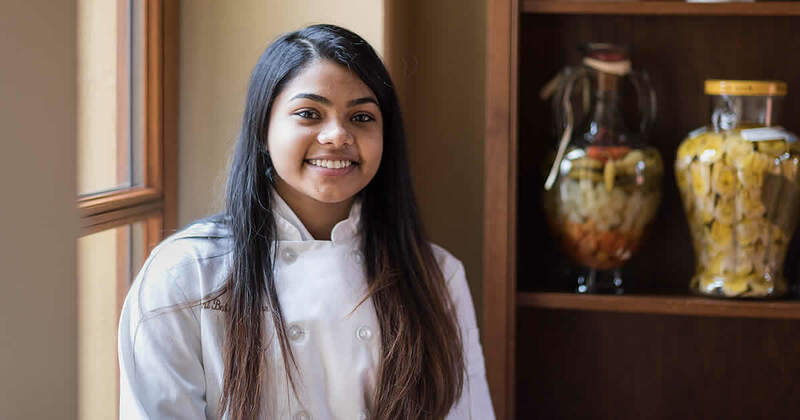 I really want to work in fine-dining establishments and I feel that the sense of urgency and attention to detail that is taught from day one at the CIA is really going to help me reach the levels that I want to in the industry. If you’re considering attending the CIA, then just do it and if you’re a new student, congratulations! You have taken the first step to becoming a remarkable chef. The Culinary Institute of America is filled with endless opportunities. Just stay focused and get involved!